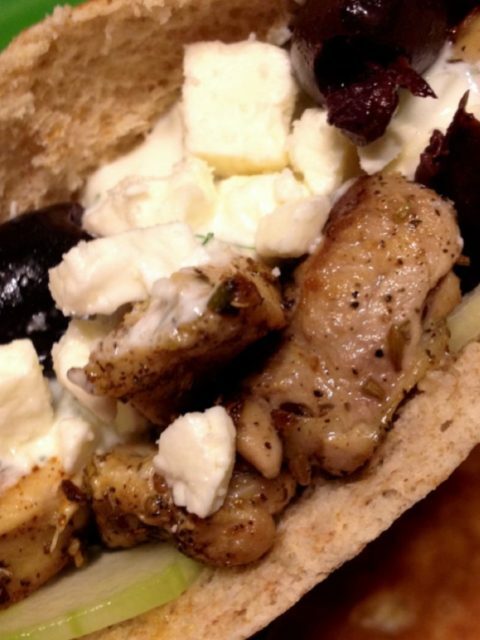 I have been craving a Chicken Gyro. Although, I am not sure if I am really just craving the Changing Seasonings Greek Isle seasoning blend I use, or perhaps the fresh Tzatziki sauce. Probably both. 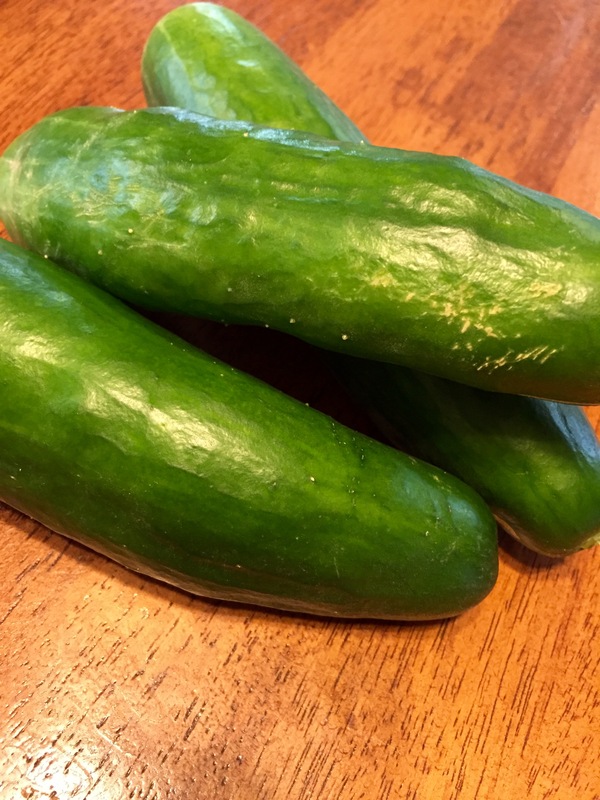 I ate a ton of Greek last summer, but took a little break once my garden stopped giving me cucumbers. This spring, I planted two cucumber plants in my little garden. One, was a plant that was withered at the greenhouse so the owner just tossed it in for free to see if I could salvage the poor little thing. Both plants are growing like crazy though, in what is best described as an attempt to take over the world. I don’t even think I will get a good harvest of green beans before the cucumber plants sprawl out with their tiny but strong little tentacles that grab onto whatever they can and take over an entire corner of my garden. I have a ton of blossoms, and in turn, will have bunches of cucumbers again this year. 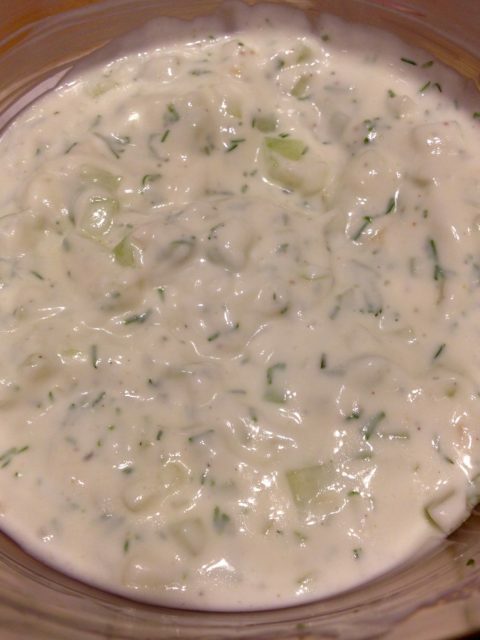 Tzatziki is a Greek sauce that is used to top meats, on gyros, and as a dip. A local to me restaurant uses it as a dip for a tasty little potato wedge appetizer. The wedges are coated in a Bay Seasoning, like Changing Seasonings Calypso blend. The two compliment each other perfectly. Let’s just say, the ratio of Tzatziki to wedge is not balanced when I am eating this appetizer. The wedges become more of a utensil to scoop the dip into my mouth. Tzatziki is pretty simple to prepare. There are a few different variations out there, but the basic ingredients are the same: Greek yogurt, cucumber, lemon juice, garlic, olive oil and dill. Some people shred the cucumber and some chop it. Either is acceptable. 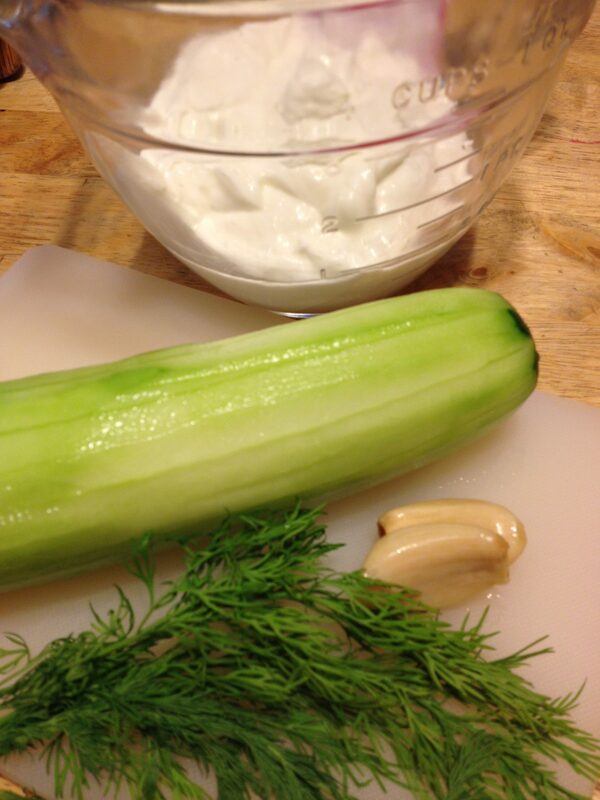 Some also blend or use a food processor to mix the Tzatziki to a smooth sauce or dressing consistency. I prepare it differently based on what I am going to use it for, but I think shredding the cucumber is my general go-to way. This is a good place for a reminder of the rule of thumb when trying to decide how much of a dry spice to use in place of fresh herbs. The typical equation is three times the amount of fresh than dry. Dried spices are more potent than fresh. Since a tablespoon is the equivalent of 3 teaspoons, if the recipe calls for 1 tablespoon of fresh dill, in this case, then you could substitute with 1 teaspoon dried dill weed. Also, remember that there is a difference in dill weed and dill seed, and they are not interchangeable in this recipe. Dill weed is the fresh leaves of the plant. Often used in Mediterranean dishes, dill weed compliments carrots, cucumber, eggs, fish and seafood, basil, garlic, mustard and parsley. Dill weed is more flavorful fresh or frozen, not as much when dried. If used in cooking, add the dill weed at the end of cooking so it doesn’t lose potency. Dill seed is used mostly is slow cooked foods and compliments cabbage, onions, potatoes, cumin, garlic, and ginger. Both are used in pickling. 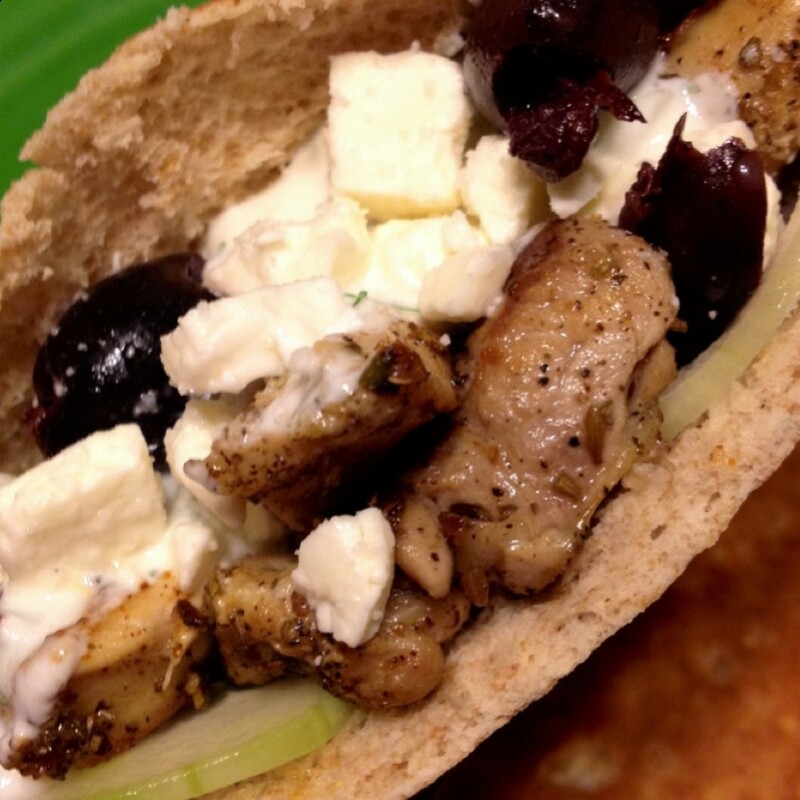 Most recently, I have topped both Chicken Gyros and Shrimp Gyros with Tzatziki. Just season the chicken or shrimp with Greek spice before cooking (both are great on the grill!). Put on pita bread with thin sliced sweet onion, feta cheese, thin sliced tomato, thin sliced cucumber (optional), and Tzatziki. Top with pitted kalamata olives. Yum! 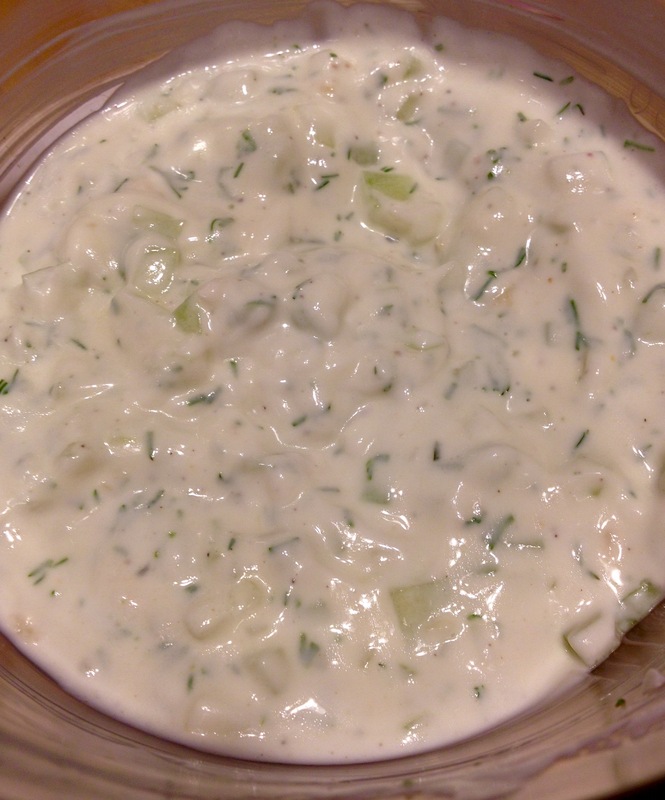 A cool, fresh Greek dip or condiment that is made with cucumber.